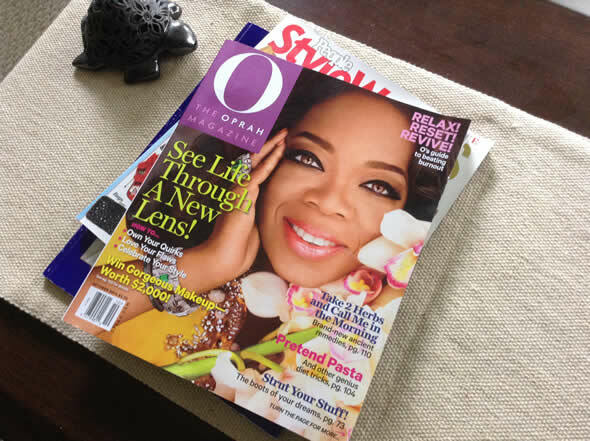 The October issue of O Magazine, known as the Beauty Issue, has Oprah looking exotic, surrounded by orchids, wearing a glittering yellow dress, and (what…hold on…) light colored hazel eyes? It’s only one of four covers Oprah did for the magazine this month but for contact lens wearers, it’s the most interesting. But for girls with dark eyes, trying on a lighter eye color can be a fun change, and Oprah’s eye color looks amazing in this photo. If you don’t want crazy electric blue, Hazel or Honey colored contacts provide the most natural looking results on dark brown eyes. On the cover, Oprah’s eyes almost have a violet hue, which I can vouch for when changing dark eyes. For some reason, hazel on dark brown has that effect. Oprah is wearing Alcon AIR OPTIX® Colors prescription contact lenses (affiliate link) in Pure Hazel. These new lenses, based on the popular AIR OPTIX brand were introduced in the US earlier this year. More here. Our disclosure: We are long time affiliates for AC Lens and have used and recommended their products and service since 2005. 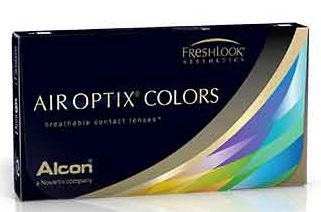 AIR OPTIX come in nine colors ranging from subtle to vibrant and are monthly replacement, daily wear silicone hydrogel color lenses. According to the manufacturer Alcon, the natural-looking color is contained inside the lens material, so that the only thing touching the wearer’s eyes is the ultra-smooth permanent plasma surface of AIR OPTIX®lens itself. Like all color contacts in the US, AIR OPTIX® Colors contact lenses are available by prescription only from your eye care professional. If you don’t need these lenses to correct vision, your eye doctor can also prescribe the lenses in ”plano” (non-corrective). AND, if you already wear AIR OPTIX® AQUA contact lens there is no refit required for the color versions. If you’re thinking of trying OPTIX® COLORS before you buy, check out the AIR OPTIX® COLORS Color Studio at www.airoptixcolors.com/colorstudio to upload a photo and virtually “try on” any of the nine beautiful shades. Let me know in the comments if you’ve tried any of the colors and what you think of them.